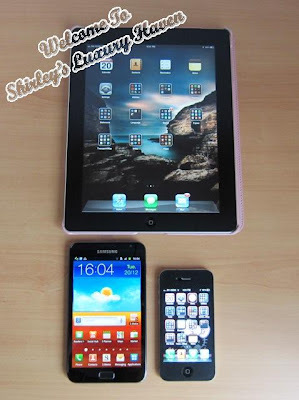 You are here:Home » Product Reviews » Samsung Galaxy Note: Is It A Phone Or A Tablet? The current crave in owning the latest mobile device is probably the Samsung Galaxy Note. My closest encounter with a Samsung device was the Galaxy S Wi-Fi 5.0, onboard the Finnair’s Angry Birds Flight from Helsinki to S’pore. 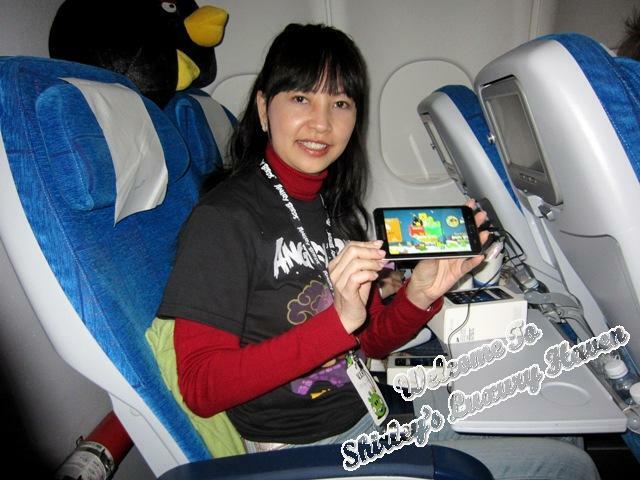 All passengers on that special flight got to play the Angry Birds game with the gadget. How cool is that! Like my tee? Well, all team members of the Angry Birds Asian Challenge gotta put on one of these tees for the flight too. Pretty awesome, huh? I was exhilarated when I was offered the chance to own this awesome device & to do a review. People are currently snapping up this gadget & many places are out of stock. Lucky me, this special batch also comes with a free Flip Cover worth S$89, which I will be picking up at a later date. To do this review, I had to attend a workshop organized by Samsung, with few other bloggers for a brief walk-through. Refreshments were also served at the event. Shall we start with its size? To give you a better idea instead of telling you it's 5.3", I’ve put the Galaxy Note together with my iPhone4 & iPad2. This powerful performance 1.4GHz Dual Core Android Smartphone has a large screen & holds the world's first 5.3” HD Super Amoled high-resolution touchscreen with an ultra light & slim design. For those who are always on the road, you’ll be delighted to know that texting will no longer be a hindrance. No hands off the steering wheel, or eyes off the road. 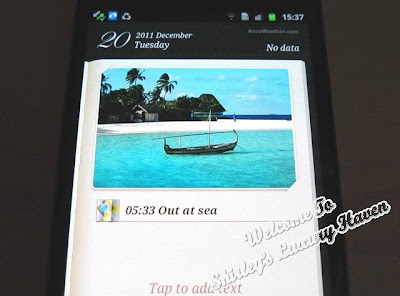 Just instruct your Galaxy Note to “call” or “message” & it will dial the number or type out your text message for you. Messaging is now a breeze. I gave the instruction "Coming home for dinner?” & waited for it to work on my speech, as it converts into text almost instantly. It was as good as 100% accurate except for the Question Mark, which is negligible. I was impressed! 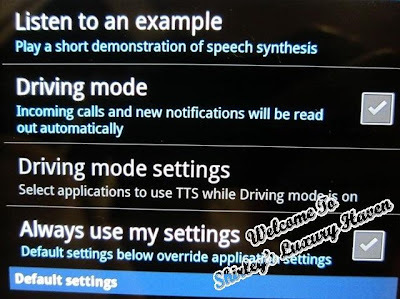 When you switch your device to driving mode, the Smartphone will also read alerts & incoming calls to you. Are you amazed? Then I tried the voice feature on the S Planner. To key in an appointment, simply tap on the Microphone icon if you’re lazy to type & a "Speak Now" box pops out. I started my speech: “Meeting @ 1 pm”. Bingo! It worked like a charm! My text was entered automatically under the header. From here, you can continue to edit details & save to your calendar. So far, the voice sensor is quite sensitive & precise in picking up most English words. The S Planner provides you the tools, where complex schedules became simple. It's like having an efficient & intelligent personal secretary in your pocket. 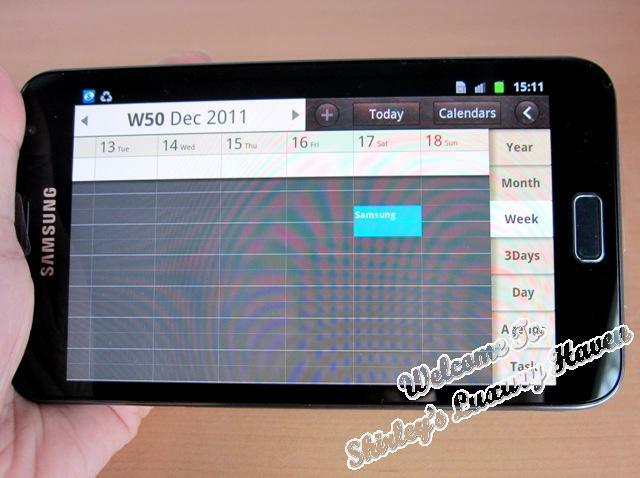 In the S Planner, you can view your calendar from Year to Day, or in Agenda or Task mode with just a simple tap. To change the date of schedule, simply drag the old appointment to the new date! 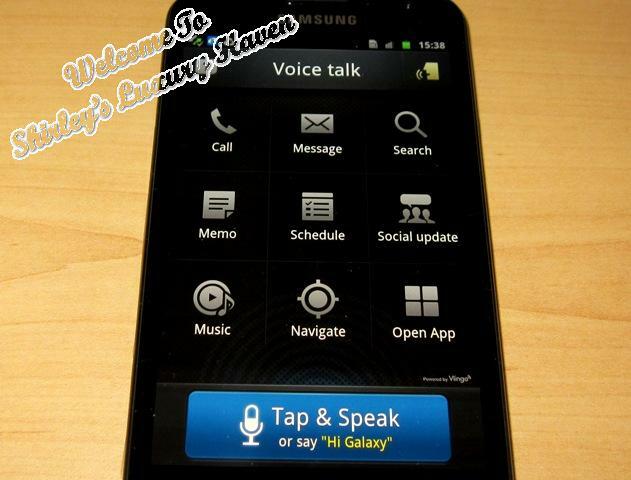 The Voice Talk feature is accessible via various manners in the pix above. You can easily start the commands by tapping on the blue tab & begin speaking. Samsung certainly deserves tribute for transporting the stylus back into the 21st century with an ambitious Advanced Smart Pen. The main idea of the S Pen & its integrated abilities, which include native art, design & note-based apps, is to allow for hand-written & hand drawn content. With it, you can sketch drawings or write notes effortlessly. You can see from the pix a cropped section from a map & hand-written “Meet Me Here” using the S Pen. Save the work & send it to your friend & the meeting place will never go wrong. Have an idea that just popped up? Scribble it down & string your thoughts to the S Memo with added graphics or voice recordings to share them with your clients. Communication is no longer limited to just text. 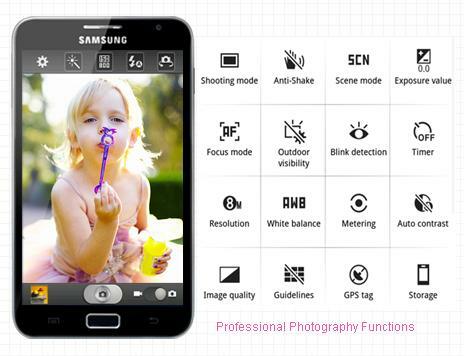 With the Galaxy Note, enhance your thoughts & ideas with the host of multimedia available.. The Mini Diary is another superb app for you to pen your thoughts for the day. I keyed in “Out At Sea” & included a pix to record my day’s activity. It’s as good as an electronic diary on the go. Just look at the rich colours displayed here! Experience business solutions with the built in Polaris Office that supports Microsoft Word, Excel & PowerPoint. The Office works with the S-Pen too, allowing you to literally pen your thoughts. With the Galaxy Note 8 Megapixel Camera, you can now capture stunning photos even in low light conditions with the built-in LED flash & Auto Focus camera. This is a great 2-in-1 gadget for those who find it cumbersome to carry both a mobile phone & a tablet or laptop out. As a phone, the device is a little flamboyant due to its size. If you feel a tat bit embarrassed fishing out the biggest phone in the market from your pocket or bag to chat, you can always use the ear-piece that comes with it instead. Most importantly, the Galaxy Note comes with a MicroSD slot with further expansion up to 32GB. Plus, the pre-bundled S Pen active stylus adds a whole new dimension to the Smartphone experience. The powerful, light-weight, do-it-all Samsung Smartphone packs a punch, & promises to deliver! I tested it out. All the above functioned w/o me inserting any SIM card & it worked like magic. I just tapped on my home wifi connection to do the job. So if you’re abroad & don't wanna use your SIM card, just look for a hotspot to surf or check your emails. i want that for christmas present. 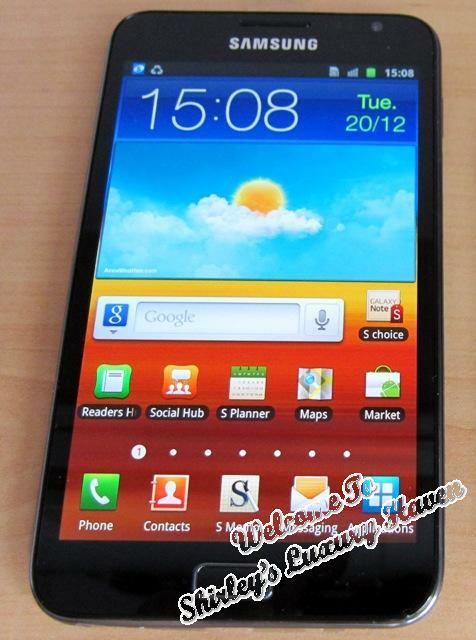 i heard a lot about Samsung Galaxy...is it good? Loveforfood, I gave it a 4-star. So do u think it's good? Don't be naughty cause Santa may be nice & generous :) Hohoho! This is awesome! 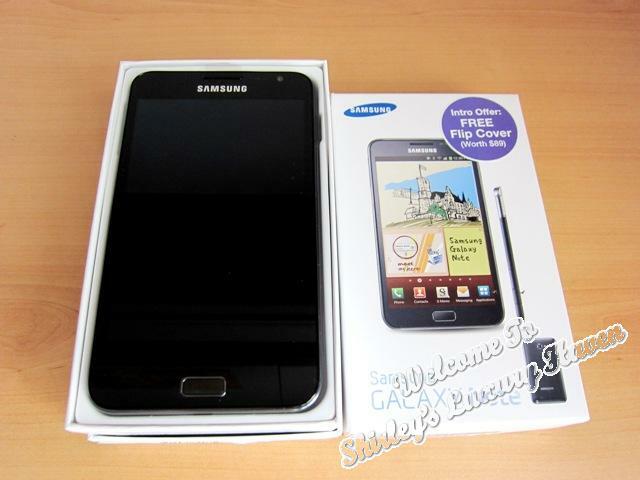 Galaxy Note is good as phone and tablet! Seems like a great product esp after reading what you have shared Shirley but I am quite contented with my blackberry for the time being, maybe will consider in the near future. Wow! Cool! Like a mini PC in your pocket. Surely a choice buy. i wish sumone can give it to me one day.. hahhaha ! Nava, my ex-boss is holding a Blackberry now but switching to Galaxy Note after seeing my review. Lol! Merry X'mas, dear! Charmaine, r u holding one too? Doris, very tempting indeed. Heehee! Xue Ren, glad u found my review useful! Samsung Galaxy is everywhere & i'm tempted to have one too! huuhuu..it looks cool! Have a Merry Christmas, love! Regards to you and your family! Pretty cool! I have the iPhone and iPad and carry both. I find that I pull my phone out a LOT for simple computer work - so this is a great idea! Wi, u're finally back! Didn't hear from u for a while. On vacation?? Merry X'mas, dear! Cool phone! Enjoy your new toy :) Merry Christmas! i sooo love it!!! am so gonna buy it... nice pics too,,, you are gorgeous... have a blessed christmas!!! Biren, thks & Merry Xmas! Dina, thks for visiting! Have a beautiful Xmas & will chk u out soon! Jay, I know u'll gonna love this toy! Charles, that's so cool! Do u get to play with it too? It's certainly a pleasure knowing a sweet blogger like u. Have fun & thks so much for supporting my blog! Evelyn, so sorry to hear that but SII is also a great hp. Merry X'mas, dear! Veron, happy 2012 & have fun with all the gadgets! 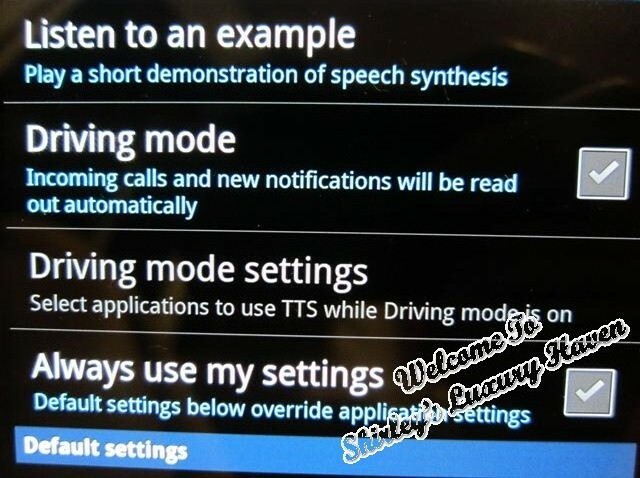 Shirley, i m already using this Galaxy Note for awhile n gers there, S2 is as good as Note, nothing to regret n also, the voice talk was there in S2 too, caused i was using S2 b4 Note, both are great phone frm Samsung, i love it so much !!! Jordan, looks like we've a Samsung fan here :) My hubby is also using the SII & is having a good time with his toy. Definitely a samsung galaxy fan here. It's sure better than the iphone.